Dwight writes, "I was born in 1969 and vividly remember watching the 17 mission, and then having my father take my outside to look at the moon. He then asked me if I could see the men on there! His enthusiasm for the Apollo missions wore off onto me, and loosely followed what I could based on the scarce video material available. In 1989 I was in the USA and managed to see A&E's 'As It Happened' special which had the complete downlink of A11. From there I was hooked." At a Mission Elapsed Time of 139:40:04, about 30 minutes after the EVA-2 wake-up call, the comm link between Australia and Houston was lost and, in what he later described as the 'highlight' of his long career, Honeysuckle Creek Operations Manager John Saxon spent six and a half minutes talking to John Young and Charlie Duke, a conversation in which Young asked the Aussies to 'have a Swan for us'. Swan Lager is a Western Australian beer. Saxon replied with a 'permanent invite' for the crew to visit Honeysuckle after the mission and promised to 'keep the beer cool for you'. 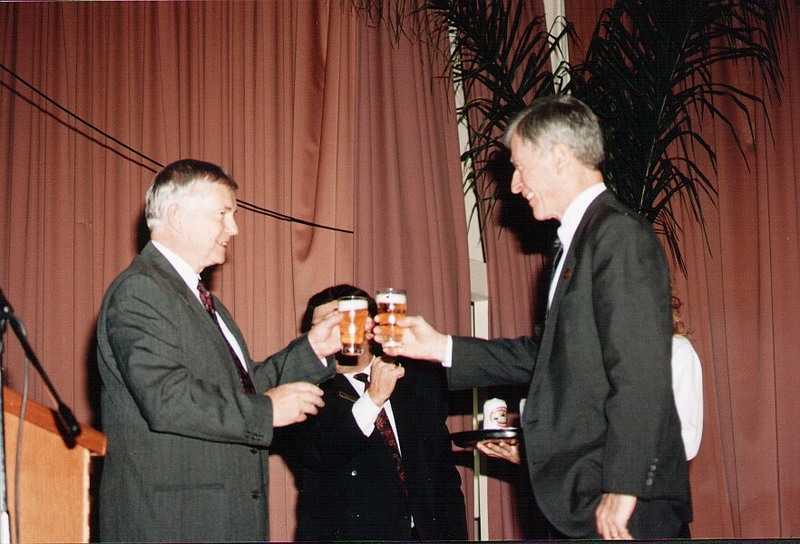 On the 25th anniversary of Apollo 11, John Young visited Australia to present a large lunar sample and, on that occasion, Saxon was able to 'shout' Young to a Swan. Dwight continues his own story: "It was not until 2002, after discovering the ALSJ and acquiring some Spacecraftfilms DVDs that I seriously got into the Apollo missions. 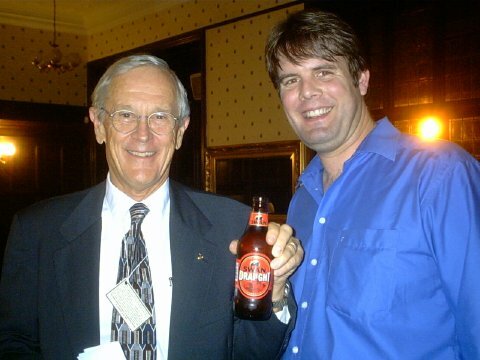 Being Australian, being in contact with John Saxon, and knowing I would meet Charlie Duke at the (9 October 2004) Autographica convention in the UK, it seemed only right that Charlie should be presented with the Swan Beer. Saxon supplied a letter for Charlie and I arranged to get the Swan Brewery to ship out some beer especially for the event." "Apart from my space interest, I also work as a Transmission Controller for RTL Television in Germany. I am stilled awed by the way in which satellite communication works, and I am duly astounded at the apparent ease at which the tracking station folk brought the world lunar TV!" Dwight has provided the following from the Apogee Books page for his 2010 book, Live TV from the Moon. 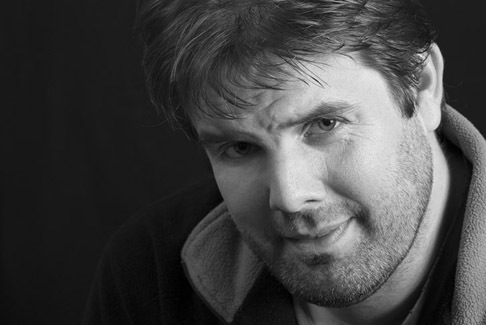 Dwight Steven-Boniecki was born in Sydney, Australia in 1969 a few months before man walked on the moon. He spent much of his childhood fascinated with space exploration - growing up in the shadow of Apollo and under the direct influence of science fiction films such as Star Wars. The latter shaping his desire to work in the film/television industry. After studying television theory at North Sydney Technical College he moved to San Diego, USA. He returned to Australia and worked in TV before heading back to university where he majored in Psychology. Following his studies he decided that television was where he truly wanted to be and returned to the TV industry. From there he heard about the expansion on satellite TV in Eastern Europe and jumped on a plane to work in Europe: first in Great Britain, and then in Germany - where he still works today as a transmission engineer. All the while, his interest in space exploration never left him. The advance of DVDs and the internet saw him revisiting the missions he recalled watching as a young child. While watching the missions again, he began to wonder about the technology behind the images he was watching, and so he began researching the television systems developed by NASA mainly to satisfy his own curiosity. To his dismay he discovered that while the information was available, it was not easy to access, and had never been comprehensively written about. He set about to change that, and ended up writing his first book, "Live TV From the Moon". Along the way he befriended many of the people who were directly involved in building the TV cameras which transmitted arguably the most important television signals ever received on planet earth - and is proud to have been able to tell their story.